Tournai (French pronunciation: ​[tuʁnɛ]; Latin: Tornacum, Picard: Tornai), known in Dutch as Doornik and historically as Dornick in English, is a Walloon municipality of Belgium, 85 kilometres (53 miles) southwest of Brussels on the river Scheldt. In the province of Hainaut, Tournai is part of Eurometropolis Lille–Kortrijk–Tournai, which had 2,155,161 residents in 2008. Tournai is one of the oldest cities in Belgium and has played an important role in the country's cultural history. Tournai is located in the Wallonia and Romance Flanders region of Belgium, at the southern limit of the Flemish plain, in the basin of the River Scheldt (Escaut in French, Schelde in Dutch). Administratively, the town is part of the Province of Hainaut, itself part of Wallonia. 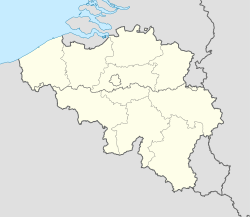 It is also a municipality that is part of the French-speaking Community of Belgium. Tournai has its own arrondissements, both administrative and judicial. Its area of 213.75 square kilometres (82.53 square miles) makes it the largest municipality in size in Belgium; it is also the largest in population in Western Hainaut. The municipality of Tournai consists of the former municipalities of Ere, Saint-Maur, Orcq, Esplechin, Froyennes, Froidmont, Willemeau, Ramegnies-Chin, Templeuve, Chercq, Blandain, Hertain, Lamain, Marquain, Gaurain-Ramecroix, Havinnes, Beclers, Thimougies, Barry, Maulde, Vaulx, Vezon, Kain, Melles, Quartes, Rumillies, Mont-Saint-Aubert, Mourcourt and Warchin. Rocks from the Tournai area date from the Carboniferous Period and have been used to define the Tournaisian Age, a subdivision of the Carboniferous lasting from 359 to 345 million years ago. Tournai stone is a dark limestone which takes a polish and was used particularly in the Romanesque period for sculpted items such as Tournai fonts. It is also hard enough to have been used locally for pavements and kerb-stones. It is sometimes called Tournai marble, though this is geologically inaccurate. Tournai, known as Tornacum, was a place of minor importance in Roman times, a stopping place where the Roman road from Cologne on the Rhine to Boulogne on the coast crossed the river Scheldt. It was fortified under Maximian in the 3rd century AD, when the Roman limes was withdrawn to the string of outposts along the road. It came into the possession of the Salian Franks in 432. Under king Childeric I, whose tomb was discovered there in 1653, Tournai was the capital of the Frankish empire. In 486, Clovis moved the center of power to Paris. In turn, a native son of Tournai, Eleutherius, became bishop of the newly created bishopric of Tournai, extending over most of the area west of the Scheldt. In 862 Charles the Bald, first king of Western Francia and still to become Holy Roman Emperor, would make Tournai the seat of the County of Flanders. After the partition of the Frankish empire by the Treaties of Verdun (843) and of Meerssen (870), Tournai remained in the western part of the empire, which in 987 became France. The city participated in 11th-century rise of towns in the Low Countries, with a woollen cloth industry based on English wool, which soon made it attractive to wealthy merchants. An ambitious rebuilding of the cathedral was initiated in 1030. The commune's drive for independence from the local counts succeeded in 1187, and the city was henceforth directly subordinated to the French Crown, as the seigneurie de Tournaisis, as the city's environs are called. 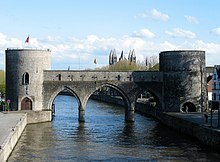 The stone Pont des Trous over the Scheldt, with defensive towers at either end, was built in 1290, replacing an earlier wooden structure. During the 15th century, the city's textile trade boomed and it became an important supplier of tapestry. The art of painting flourished too: Jacques Daret, Robert Campin and Rogier van der Weyden all came from Tournai. It was captured in 1513 by Henry VIII of England, making it the only Belgian city ever to have been ruled by England. It was also represented in the 1515 Parliament of England. The city was handed back to French rule in 1519, following the Treaty of London (1518). In 1521, Emperor Charles V added the city to his possessions in the Low Countries, leading to a period of religious strife and economic decline. During the 16th century, Tournai was a bulwark of Calvinism, but eventually it was conquered by the Spanish governor of the Low Countries, the Duke of Parma, following a prolonged siege in 1581. After the fall of the city, its Protestant inhabitants were given one year to sell their possessions and emigrate, a policy that was at the time considered relatively humane, since very often religious opponents were simply massacred. One century later, in 1668, the city briefly returned to France under Louis XIV in the Treaty of Aachen. After the end of the War of Spanish Succession in 1713, under terms of the Treaty of Utrecht the former Spanish Netherlands, including Tournai, came into possession of the Austrian Habsburgs. In 1794, France annexed the Austrian Netherlands during the French Revolutionary Wars and Tournai became part of the department of Jemmape. From 1815 on, following the Napoleonic Wars, Tournai formed part of the United Netherlands and after 1830 of newly independent Belgium. Badly damaged in 1940, Tournai has since been carefully restored. Tournai is considered to be one of the most important cultural sites in Belgium. The mixed Romanesque- and Gothic-style cathedral of Notre Dame de Tournai and the belfry, considered the oldest in Belgium, have been designated by UNESCO as World Heritage Sites. Inside the cathedral, the Châsse de Notre-Dame flamande, a beautifully ornate 12th-century reliquary, gives witness to Tournai's wealth in the Middle Ages. Other places of interest are the 13th-century Scheldt bridge (Pont des Trous) and the main square (Grand Place), as well as several old city gates, historic warehouses, and a variety of museums. On rue Barre-St-Brice are two of the oldest private houses in Europe, dating from between 1175 and 1200 and built in the Romanesque style, while the rue des Jésuites includes a Gothic house from the 13th century. As in many Belgian cities there are a number of cafés and pubs in the Grand Place. In the middle of the Grand Place there are a series of water fountains while the circular staircase to the top of the belfry can be climbed. There are several buildings in the art nouveau style. Tournai is a French-speaking town of Belgium. The local language is tournaisien, a Picard dialect similar to that of other communes of Hainaut and Northern France. The gothic choir of Our Lady's Cathedral is a precursory element of the Scaldian (meaning from the Scheldt area), typically Flemish, Gothic art. The bishopric of Tournai was the religious capital of Flanders during more than a millennium (from 496 to 1559). The tapestries and draperies of Tournai belong to the great Flemish school of tapestry and Tournai was part of the Flemish Hansa of London, which also included the draper towns of Flanders. The Saint-Brice church of Tournai, dedicated to Saint Britius, is one of the first examples of the hallekerk style, so typical of the Flemish countryside. Some of the great Flemish Primitives are from Tournai: Robert Campin, Rogier van der Weyden, Jacques Daret. Although Tournai is in the Flemish cultural area (of the Scheldt), it also possesses some treasures of the Mosan style. Indeed, the two most beautiful shrines of the Cathedral, commissioned by the Bishop of Tournai, were made in the region of Liège by the artist Nicholas of Verdun: the shrines of Saint-Eleutherius and of Our Lady of Flanders (13th century). Those shrines testify to the opulence of the towns of Tournai and Liège during the Middle-Ages. The shrine of Our Lady of Flanders has been called one of the seven wonders of Belgium. The "Great Procession" (in French: Grande Procession) is a procession initiated by the bishop Radbot II during a plague epidemic. It has taken place every year since 1092, with the single exception of the year 1566, when the iconoclasts considerably damaged the religious symbols of the city. This historic procession unfolds in the streets every second Sunday of September. The first Monday after January 6 is known as "Lost Monday" (in French: Lundi perdu) or "Perjury Monday" (Lundi parjuré). This tradition dates from more than 700 years ago. The wealthier city inhabitants used to prepare fastidious family dinners and elect a king. Today, the family dinners have expanded to wider groups and a rabbit dish is often served. The Faculty of architecture, architectural engineering and urban planning of the University of Louvain (UCLouvain) is located in Tournai. Louise-Françoise de Bourbon (1673–1743) illegitimate daughter of Louis XIV of France and his most famous mistress Madame de Montespan. Philippe de la Motte, 1556-1617, Pastor at Tournai (1582/3) and of Walloon Church, Southampton (1586). ^ "EUROMETROPOLIS : Eurometropolis Lille-Kortrijk-Tournai , the 1st european cross-bordrer metropolis". eurometropolis.eu. Retrieved 15 February 2017. ^ Williams, Stephen. Diocletian and the Roman Recovery. New York: Routledge, 1997:50f. ^ Archaeology in Europe Educational Resources. "Location of Childeric's Grave". Archived from the original on 1 July 2015. Retrieved 21 May 2015. ^ Davies, C. S. L. "Tournai and the English crown, 1513-1519." Historical Journal (1998): 1-26. ^ UNESCO, World Heritage List. "Notre-Dame Cathedral in Tournai". UNESCO » Culture » World Heritage Centre » The List » World Heritage List. Retrieved 21 May 2015. ^ UNESCO, World Heritage List. "Belfries of Belgium and France". Retrieved 21 May 2015. ^ Tournai Office du Tourisme. "The " Pont des Trous"". Home / See & do / Attractions /The " Pont des Trous". ^ Tourisme Wallonie. "Visite : Monument LES MAISONS ROMANES" (in French). Retrieved 21 May 2015. ^ "Tournai jumelé avec Bethléem". dhnet.be. Retrieved 15 February 2017. Wikimedia Commons has media related to Tournai. Wikivoyage has a travel guide for Tournai. Internationale petitie tegen het bouwproject van een toren in de Unesco zone van de kathedraal van Doornik (België). Official site — The city's site, available in French, English and Dutch. Tournai City.net — Online directory for this city. Joan of Arc's letter to Tournai — English translation (by Allen Williamson) of this letter dictated by Joan of Arc on June 25, 1429. Apis Tornacensis — database and bibliography about history. Société Royale d'Histoire et d'Archéologie de Tournai, an exhaustive list of references on the history of the Tournai region, in French. Dendermonde is a Belgian city and municipality located in the Flemish province of East Flanders in the Denderstreek. The municipality comprises the city of Dendermonde proper and the towns of Appels, Baasrode, Grembergen, Mespelare, Oudegem, Schoonaarde, and Sint-Gillis-bij-Dendermonde. Dendermonde is located at the mouth of the river Dender, where it flows into the Scheldt. The town has a long-standing (folkloric) feud with Aalst, which dates back from the Middle Ages. Oudenaarde is a Belgian municipality in the Flemish province of East Flanders. The municipality comprises the city of Oudenaarde proper and the towns of Bevere, Edelare, Eine, Ename, Heurne, Leupegem, Mater, Melden, Mullem, Nederename, Welden, Volkegem and a part of Ooike. Mouscron is a Walloon city and municipality located in the Belgian province of Hainaut, along the border with the French city of Tourcoing, which is part of the Lille metropolitan area. The Mouscron municipality also includes the old municipalities of Dottignies, Luingne, and Herseaux. In accordance with the national law, the municipality offers dual language services in French and Dutch. Kortrijk, in Flanders, is located just to the north of Mouscron. Rogier van der Weyden or Roger de la Pasture was an Early Netherlandish painter whose surviving works consist mainly of religious triptychs, altarpieces and commissioned single and diptych portraits. He was highly successful and internationally famous in his lifetime; his paintings were exported – or taken – to Italy and Spain, and he received commissions from, amongst others, Philip the Good, Netherlandish nobility, and foreign princes. By the latter half of the 15th century, he had eclipsed Jan van Eyck in popularity. However his fame lasted only until the 17th century, and largely due to changing taste, he was almost totally forgotten by the mid-18th century. 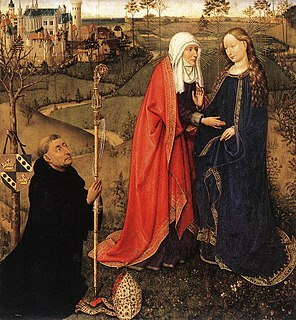 His reputation was slowly rebuilt during the following 200 years; today he is known, with Robert Campin and van Eyck, as the third of the three great Early Flemish artists, and widely as the most influential Northern painter of the 15th century. Robert Campin, now usually identified with the Master of Flémalle, was the first great master of Flemish and Early Netherlandish painting. Campin's identity and the attribution of the paintings in both the "Campin" and "Master of Flémalle" groupings have been a matter of controversy for decades. Campin was highly successful during his lifetime, and thus his activities are relatively well documented, but he did not sign or date his works, and none can be securely connected with him. A corpus of work attached to the unidentified "Master of Flémalle", so named in the 19th century after three religious panels said to have come from a monastery in Flémalle. They are each assumed to be wings of triptychs or polyptychs, and are the Virgin and Child with a Firescreen now in London, a panel fragment with the Thief on the Cross in Frankfurt, and the Brussels version of the Mérode Altarpiece. Jacques Daret was an Early Netherlandish painter born in Tournai, where he would spend much of his life. Daret spent 15 years as a pupil in the studio of Robert Campin, alongside Rogier or Rogelet de le Pasture, and afterwards became a master in his own right. He became a favorite of the Burgundian court, and his patron for 20 years was the abbot of St. Vaast in Arras, Jean de Clercq. The Belfries of Belgium and France are a group of 56 historical buildings designated by UNESCO as World Heritage Site, in recognition of an architectural manifestation of emerging civic independence from feudal and religious influences in historic Flanders and neighboring regions of the Duchy of Burgundy. Kortrijk is a Belgian city and municipality in the Flemish province of West Flanders. Brabantine Gothic, occasionally called Brabantian Gothic, is a significant variant of Gothic architecture that is typical for the Low Countries. It surfaced in the first half of the 14th century at Saint Rumbold's Cathedral in the City of Mechelen. The Tournaisis was a small territory in the Low Countries independent during the Middle Ages, consisting of the city of Tournai and the surrounding area. Jean Wauquelin presenting his 'Chroniques de Hainaut' to Philip the Good is a presentation miniature believed to have been painted by the Flemish artist Rogier van der Weyden. It decorates the frontispiece to the Chroniques de Hainaut, MS KBR.9242, a translation from Latin into French of a three volume history in of the County of Hainaut by Jean Wauquelin. The Latin text was originally written by the 14th century Franciscan historian Jacques de Guyse. The County of Flanders was a historic territory in the Low Countries. The Chronicles of Hainaut is an illuminated manuscript in three volumes, tracing the history of the county of Hainaut up to the end of the 14th century. Its text was produced around 1446-1450 by Jean Wauquelin as a French translation of Annales historiae illustrium principum Hannoniæ, a three-volume Latin work produced by Jacques de Guise around 1390-1396. It was made for Philip III of Burgundy and is now in the Bibliothèque royale de Belgique in Brussels.